Use Home Depot’s shiplap appearance boards for your fireplace makeover like DIY blogger Amanda Hendrix from Love and Renovations. I recently used The Home Depot’s shiplap appearance boards to give my fireplace a major makeover. I was pretty blown away at how simple it was to install (I’d consider myself a beginner when it comes to power tools, but I did the entire makeover by myself!) and the fireplace makeover is absolutely incredible. I’m so glad we got this done just in time for the weather to cool off a bit, and I can’t wait to light the first fire of the season! For us, the first thing we that needed to happen was replacing the tile on the fireplace surround. Here’s a quick before of what our fireplace looked like when we were getting started (and yes, the tile on the bottom right had been missing for at least three years). After demoing the tile, much of the drywall behind it was destroyed. I cut new drywall to fit, screwed it into place, and did a quick taping and mudding job. It was really simple to replace, and only took about an hour or so. Once the tile was done, it was time for the fun part – shiplap! These shiplap appearance boards from Home Depot were so easy to use, and look much more authentic than DIY alternatives. The first step to installation is to mark the studs on your walls so you know where to place your nails. 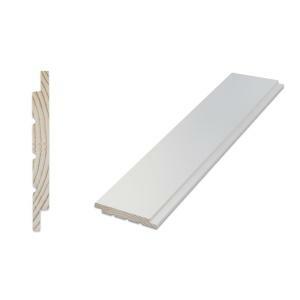 Your boards will be much more sturdy if you nail directly into the studs rather than drywall, and things will hold up much better in the long run. Use a stud finder to locate each stud, then use a pen or marker to draw a line down your wall where the studs are. You’ll want to begin laying your shiplap along the top of the wall, and use a level to make sure that first board is straight. It’s highly likely that your ceiling is not level, so don’t trust the ceiling line or your entire wall may be crooked. Simply hold the first board up, use a level to make sure it’s straight, and nail it into place. The next board will fit right up against the first one – these boards are tongue and groove and, once you install them, they’ll have a perfect gap between them. The beauty of something like this over a DIY shiplap is that you don’t have to paint the wall behind it – since the tongue of the bottom board will fill the gap, all you can see is the boards and the wall is not visible at all once you’re done. Since our shiplap would be wrapping around the fireplace, that meant we needed to miter each corner so they came together at an angle. You can accomplish this with your miter saw – just tilt it at a 45-degree angle, measure your wall, and cut so that the back of the board meets your measurement – the front will stick out slightly past the end of the wall. When you place the board on the other side of it, the ends will meet and create a corner. I’m not a professional by any means, so not all of my corners were perfect. However, since I planned to add corner trim around the fireplace, it wasn’t a big deal. The edges of these boards can be sharp, and it may not be a great idea to just leave them bare (not to mention how difficult it would be to get every single corner to line up perfectly!). Thankfully corner trim can cover a lot of mistakes and will make the finished product look much more polished. Continue laying your shiplap until the entire space is covered. I had to cover all 4 sides of my fireplace, including a little cove on the front. If you’re covering up any sort of outlet or light switch (we had an outlet, a light switch, and the starter for our gas fireplace), you’ll need to use your jigsaw to cut a hole in the board for the outlet. You’ll also likely need to use outlet extenders when you re-install the outlet covers so that everything fits correctly. At this point, things may still look a little bit crazy – just remember that adding trim and caulking makes a world of difference. Now it’s time to add any trim pieces. I added corner molding on all of the outside corners and cove molding on the inside corners (which were just in the little nook on the front). I also added some flat trim along the ceiling, and baseboards along the floor. You can see in the image above how much of a difference caulking will make. This is where things start to feel really good! To caulk, just use your caulk gun to apply a thin bead of caulk around the seams where the boards meet, then run your finger (it helps if you wet it down a bit first) along the line of caulk to smooth it out. You’ll also want to put caulk in all of the nail holes. Once your caulk has dried (which only takes about 30 minutes to an hour), you’re ready to paint! I went with a white that had some slight yellow undertones to warm it up a bit (since it’s a large amount of white in the center of my living room) and to help provide some contrast to the bright white baseboards. Once your paint dries, you’re ready to style it and call it done! I’m so impressed with how simple this shiplap fireplace makeover was to install and how absolutely beautiful it looks in our home. This quick little makeover (it only took a few days!) completely transformed the entire first floor of our house! Find more Accent Wall and Fireplace Makeover Ideas on The Home Depot Blog. Shop shiplap and more appearance boards to create your own fireplace makeover at The Home Depot.